Hello! It's time for a brand new Mojo Monday sketch (#211).. I hope you will join us this week! I used Believe on my card today. 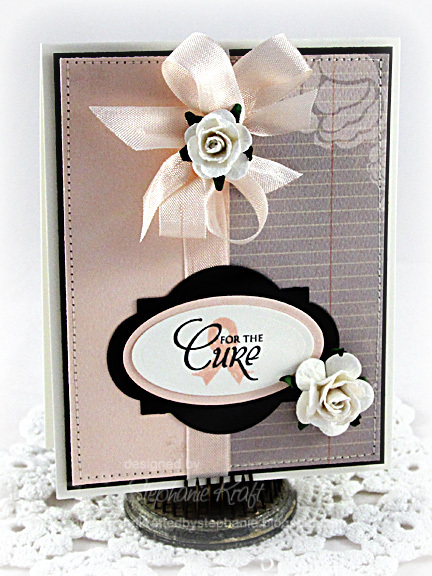 I first stamped the pink ribbon, then the sentiment over it and added some layers to my sentiment panel. Please note that $10 from the sale of every Believe set is donated to Susan G Komen for the Cure. Accessories: A Cut Above Dies: Classy Label Die (Verve), Petite Oval Nestabilities (Spellbinders), Seam binding, Open roses (Wild Orchid Crafts), Foam tape, Thread, Sewing machine. Lovely card, Stephanie! Love the bow and roses. Fabulously elegant card. Love it. Oh so elegant! Love the soft muted tones. Wonderful use of the sketch! Gorgeous and so elegant! Love it! Oh what a pretty card Stephanie and for such a wonderful cause! Love the soft pink mixed with the bold black ~ really seems to pop! Very elegant, love the bow and flowers. What a lovely card! I just love that soft pink.